LAST WEEK, I mentioned the specter that befalls many an ethnic restaurant that reaches our shores: the long process of assimilation and evolution to become something uniquely local. While the knee-jerk reaction would be to call it a bad thing, as people cling to the notion of "authenticity," just what is authentic anyway? There is no more agreement as to the real Kansas City barbecue (sweet tomato or spicy vinegar?) than there is for the real gazpacho (made with tomatoes or bread?). Cuisines have always evolved as a result of exploration that brought spices from the East to West; New World ingredients to the Old. Cuisines don't even need to travel to change, as tastes evolve, whether due to physiology or technology. In the latter case, that evolution might have started with refrigeration, which eliminated the need for old-fashioned preservation methods of salt-packing and pickling, and led to today's explosion of artificial flavors and engineered foodstuffs. What would our 18th-century ancestors have thought of Cheetos and Ho-hos? The Asian community has been particularly adept at assimilating without losing sight of their culture and heritage, helping outsiders with an open mind to learn something along the way. But education is a long and slow process. For as long as Vietnamese restaurants have been here, for instance, Tam Huynh, co-owner of Bac Nam with his wife, Kimmy, says, "Some people think Vietnamese food is only phó, and that's all they order. They ask me how come I don't have 'phó' on my sign." It's a pity, because if they looked further they'd find a lot to like on the menu. The tiny restaurant offers a vast overview of Vietnamese cuisine, from spring rolls to wraps, rice and noodle dishes, to grilled specialties calibrated to suit the local palate by blending the love of salty flavors of North Vietnam, the spiciness of Central Vietnam and the craving for sweetness in South Vietnam, although Huynh says this is changing. "I went back to Vietnam last month, and the food has changed a lot." His last previous visit to Saigon had been three years ago, he said. Maybe it's the growth of tourism, maybe it's the cost of labor, he said, but "they remade everything. It's like American fast food." 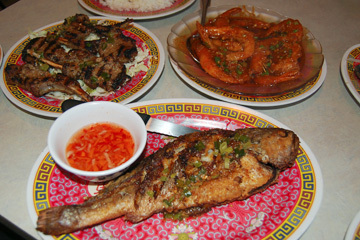 Some of the dishes available at Bac Nam include barbequed lamb, tamarind shrimp and lemongrass fish. WHAT'S served at Bac Nam might end up being closer to "authentic" than the evolutionary cuisine of the motherland, so enjoy it while you can. My method of exploring menus is to dive right in, but if baby steps are more your style, and you are just starting to look beyond the beef soup, phó, the next step is to try the stewed beef flat rice noodle ($6.95) or, if you like a little spice, Hue's spicy beef soup ($6.95). You might keep these in mind for when the weather turns cold a few months from now. Thanks to the established Ba-Le chain, locals are also very familiar with Vietnamese sandwiches, and here they're filled with the likes of pâté ($4.50), barbecue chicken ($5), chicken or beef curry ($6.95) on French bread. These are still just warm-up acts. When you're acclimated, you'll be ready to mix and match entrees the same way you'd order at a Chinese restaurant. Dishes are fairly filling, so to make the most of your dining experience, you might skip the typical deep-fried spring rolls ($6.95) common to Chinese and Thai menus, and proceed to grilled beef rolled in la lot or la lop leaves ($9.95), a dish no more challenging than teriyaki beef rolled in something innocuous like nori. This could be a complete meal for those with small appetites, because the rolls are meant to be further rolled in thin sheets of rice paper with your choice of pickled cucumbers, carrots and daikon, vermicelli, lettuce and mint, then dipped into a sweetened fish sauce. An earthy Vietnamese curry with potatoes, onion, lemongrass, coconut milk and red pepper is not to be missed. You can get it with a range of meat options from satisfying chicken ($7.95) that melts off the bone, to lamb ($8.95) and crab ($14.95 half, $28 whole). Elsewhere, flavors are intense, but I assume you wouldn't even be here if you weren't a little curious. Lemongrass is an herb prized for its bright, citrusy flavor, and it dresses chicken ($7.95) and spicy marinated fish ($13.95). Similarly, the sweet, tart tamarind coats shrimp sautéed with plenty of garlic and onions. Hopefully you'll remember to eat your vegetables as well, and green papaya salad ($6.95) is probably the best choice. You could also opt for a salad of young lotus stems ($7.95), but these tend to be rather stalky and fibrous, with a strong flavor similar to fennel that's not for everyone. As for dessert, there's basic tapioca ($2.50), or live dangerously and try the seaweed and mung bean paste in ice and coconut milk. If you've eaten ogo straight from the ocean, you won't believe it could be like candy.